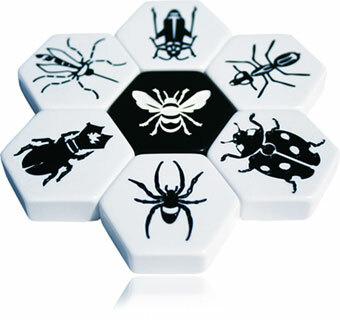 Hive Carbon is still the same as our award winning flagship Hive® game, but with a Carbon twist which is an alternative to the existing set of pieces for those who prefer a classic black and white colour scheme. Included with this edition will be the infamous mosquito piece an a very special ladybug piece. Hive Carbon is a re-release of Hive. The difference between the two are that the tiles are now presented in black and white instead of the differing colors of the original set. 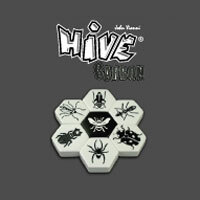 Hive Carbon also includes the expansion tiles the Mosquito and the Ladybug. the Breakdown: Hive is an abstract game based on the ideas of chess but without having the constraints of a board. Each tile contains an insect and each insect moves a specific way. The Spider moves three spaces, no more, no less. The Ant can move to any space (that he can slide into). The Grasshopper jumps over (at least one or more) other tiles. The Beetle moves one space at a time and can also jump on top of another tile pinning down the tile below him `causing it to not be able to move as well as changing its color to the color of the beetle. While on tiles, the Beetle may also move onto other adjacent tiles. The Queen Bee moves one space. The Ladybug always moves twice on top of other tiles and then one space down. The Mosquito copies the move action of an adjacent bug. At the start of the game you each place a tile adjacent to your opponent’s tile. From this point on, you may not place a tile which would be adjacent to your opponent’s tile. You must place your Queen Bee on the first, second, or third turn. You may not move a tile until your Queen Bee has been placed. Each player takes turns moving or placing their tile. You may not move a tile that would break the “Hive” in two or more parts. The goal of the game is to surround your opponents Queen Bee (can be with both your and your opponents tiles). Thoughts: I seriously love this game. I take it with me to get-togethers or bring it out when me and my friends have game night and we’re waiting around for a late-comer to show up. It’s fast and easy to learn, but difficult to master. The components are durable. The replay-ability is infinite as everyone has their own strategies. I’ve seen games ranging from 10 minute beat downs to long drawn out plays where every tile has been placed. I’ve seen people narrowly escape what seemed to be a checkmate. If you like chess, but want something quick, this game fulfills all your needs. I cannot recommend it enough. Although this review is written for Hive: Carbon it applies to Hive as well as these games are identical except for their appearance. So let’s talk about that first; appearance. Hive: Carbon is a beautiful game in it’s elegant simplicity. This game consists of 26 bakelite pieces in black and white with an image of an insect carved into each one. These pieces are quite heavy for their size but they are durable. You probably couldn’t break them if you tried. The durability of the pieces also makes this a perfect travel game since you can play this anywhere in any condition and on any surface since there is no board, the game pieces create the board as you play. Handily enough the game also comes with a nice textile zipper bag for storage when you travel with the game. But enough about how it looks, let’s get to how it plays. As a few have stated in their reviews here it is reminicent of chess. Like chess you have pieces that move in their own distinct way and you move one piece on your turn and then pass to the opponent just like chess. The game is also won by capturing your opponents king piece or Queen Bee as it is called in Hive. This however is where the similarities end. In Hive you begin the game with an empty board. One player then places any one of his pieces on the board. This is the beginning of the hive, as the game board is called, and all pieces has to be connected to the hive at all times. This continues until you place your Queen Bee on the board which can be no later then the 4th piece you place. When the Queen has been placed you are then free to move your pieces in the manner described in the rules. Some pieces move far, some move short, some can climb onto and pin other pieces or jump to the end of a straight line. In your turn you can either move a piece, if you have placed your queen on the board, or place a new piece. There is also no way of eliminating your opponents pieces but they can be hindered from moving in varying ways. The object then is to completely surround your opponents Queen and therby immediately win the game. So you can see the diffrences from chess are quite big. Pieces enter during the game rather than leave during the game. There is no fixed board but an ever changing playing field as the pices move about. You select the pieces you wish to use as you play. You can even finish the game without ever having placed some of your pieces. This brings a lot of variety to the game and think that is quite nice to see in an abstract. This is in my oppinion makes Hive a very good game for those who like abstract games such as Chess or Go. It is very easy to learn, you just have to remember how each piece can move and there are very few exeptions to the rules. But it is a deep game like other abstracts and you can probably study it for many years to come if you so wish. The box states a playing time of 20 minutes and in my experience that seem to be true. Some games may take 10 minutes and some may take 30 minutes. This all depends on the players skill level ofcourse. I would recomend this to almost all kinds of gamers, especially if you like abstract 2 player games that play fairly qiuickly and are perfect to travel with. Add a Review for "Hive: Carbon"